Haq's Musings: Are Pakistan's Uncivil Lawyers above the Law? After elevating the lawyers to very high stature, the "civil society" including foreign-funded NGOs and their media and politician cheerleaders in Pakistan have recently witnessed a string of unprovoked physical attacks by lawyers on law-enforcement officials and media men. While some of the lawyers and their supporters dismiss such incidents as isolated and involving only a few bad apples, the fact is that such violent behavior has repeatedly been displayed by Pakistani lawyers, particularly in Lahore, for at least two years or more. In the last month, there have been 18 cases of assaults carried out by lawyers in Lahore alone, according to superintendent Sohail Sukhera of Lahore police force. "In one case, lawyers broke the leg of a police inspector. Others have had their skulls exposed when lawyers have hit them on the head with stones or chair legs. It's really uncalled for." While violence by lawyers has grown in terms of numbers of incidents and intensity, the phenomenon is not new. First, during anti-Musharraf protests in Islamabad in 2007, there were repeated scenes on television that showed anti-Musharraf lawyers viciously beating up a few Musharraf supporters carrying pro-Musharraf placards outside the Supreme Court building. 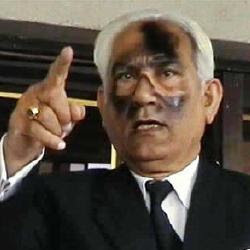 Then, there was an attack on former minister Sher Afgan Niazi by lawyers outside Lahore High Court last year. While there was no expectation from the politicians to be truthful and take responsibility for lawyers violence, it was a pleasant surprise to see Mr. Aitazaz Ahsan show a sense of responsibility by resigning. However, barely 24 hours after the resignation, Mr. Ahsan backtracked and used "conspiracy theories" and "invisible hands" and placed the blame on his favorite target: President Musharraf. Recently, media men and policemen have been the target of violence in Lahore. As the BBC reported recently, "These days, their footage is all over the Pakistani news channels. Lawyers, dressed in black suits and ties, on the attack. Every few days seem to bring a new incident; the beating of a policeman; a scuffle with members of the press outside the high court in Lahore." 1. After claiming the restoration of the rule of law in Pakistan as the goal of their protest movement against Musharraf and Zardari, the lawyers have repeatedly proved by their behavior time and again that they think they are above the law. 2. In most international opinion surveys on professional ethics, lawyers consistently rank near the bottom. They are slightly below the journalists and above the politicians and used car salesmen in how they are perceived by the general public worldwide. If the recent success of the movie "Michael Clayton" is any indication, the public perception of lawyers breaks down into four archetypes, each represented by a character in the movie: brutal (Sydney Pollack), disappointed (George Clooney), psychotic (Tom Wilkinson) and criminal (Tilda Swinton). It’s probably no coincidence that Clayton’s only Oscar went to Swinton. 3. According to a Transparency International survey, the judiciaries of India and Pakistan fare among the worst, with 77 per cent and 55 per cent of respondents in the two countries, respectively, describing the judicial system as corrupt. 4. In most of the rest of the world, the judges are generally perceived as honest. But not in South Asia. According to Transparency International surveys, the Pakistani judiciary is considered the third most corrupt institution after police and power departments. Even the taxation and customs people are regarded as more honest than the judges. Among the four provincial governments, the Transparency survey ranks Punjab (the hub of the lawyers movement) as the most corrupt and NWFP the least corrupt. 5. Pakistani judiciary, including Justice Iftikhar Chaudhry who legitimized Musharraf's overthrow of Nawaz Sharif's elected government in 1999 by taking the oath of office under PCO-I, has a long and inglorious history of undermining the laws and the constitution of Pakistan. This scribe has had personal experience with the individual judges of the highest courts showing little respect for the rule of law and engaging in corrupt practices and nepotism in their own personal lives for petty gains. The lawyers' violence is becoming so ugly that the media people, who were lawyers' closest allies opposing Musharraf, have now turned against the lawyers themselves. "The media is trying to show all lawyers in a bad light. And there are others who benefit through making us look bad," complains Raja Hanif, 33, a member of Lahore High Court Bar. However, Mr. Hanif says nothing about any disciplinary action the lawyers' body should take to punish the misbehaving lawyers for their unprofessional conduct. Now that Justice Iftikhar Chaudhry, known for frequent suo moto actions, is back on the bench as the chief justice of Pakistan, it's important for him to act to preserve the dignity of the legal profession in Pakistan. Has Pakistan's Lawyers Movement Gone Awry? Pakistan's Lawyers above the Law? Judges at India's Supreme Court have agreed to make public details about their financial assets following an intense public debate. Analyst Manoj Mitta says a lot more needs to be done to make India's judiciary transparent, according to the BBC. Given the circumstances in which judges of India's Supreme Court finally agreed to make declarations of their assets public, it seems to be a case of too little, too late. A lot more needs to be done to restore the huge amount of credibility they have lost in recent months over this issue of transparency. The decision taken by the 23 sitting judges at a special meeting this week seems to be more a damage control exercise than a change of heart. This is because Chief Justice KG Balakrishnan, for instance, has said nothing yet on whether he has changed his mind about his oft-quoted fear that the disclosure of assets might prompt people to harass judges with frivolous allegations. Reports suggest that the declarations would be put on the Supreme Court's website with the rider that no questions about those disclosures would be entertained. This gives the impression that, despite their decision to go public with details of their wealth, judges still want the kind of blanket immunity that an abortive government bill had sought to confer on them while trying to keep their declarations confidential. The anti-transparency bill, which the government was forced to defer earlier this month because of stiff resistance in the upper house of parliament, said that "no judge shall be subjected to any inquiry in relation to the contents of the declaration". In any event, judges would be mistaken if they believed that the monkey of transparency would get off their backs once the declarations of their assets were made public. Former Chief Justice JS Verma sounded overly optimistic when he said that their acceptance of the public demand for disclosing assets would end the "unsavoury debate engulfing the judiciary". It is more likely that the debate will intensify as more and more contradictions and infirmities in the most secretive organ of the state come to surface. The judicial system in Pakistan is regarded as one of the most corrupt institutions in the country. The vast majority of people that interacts with members of the judicial system encounters corruption. People regard the courts as a place where only wealthy and influential individuals can afford to pay for, and thereby obtain, fair trials. Average citizens often find themselves forced to resort to informal dispute resolution mechanisms (panchayat) rather than getting themselves involved with the official court system. The panchayat is meant to be used as a secondary institution in order to circumvent the costs and long delays in the courts. Particularly in family and land disputes, the panchayat is being utilised as a primary institution. Normally, it is only if the panchayat cannot settle the dispute that the case will be taken to a formal court. As English is the official language in Pakistan's justice system, the vast majority of the population does not understand what is going on in the courts. They depend on advice from others to help them through a trial. According to Transparency International Pakistan 2007, however, corruption also flourishes among lawyers. In order to extract more money from litigants, lawyers will sometimes provide advice that will delay or prolong the case, and sometimes even when the case should have been dismissed from the outset. According to Freedom House 2008, the judiciary in Pakistan is regarded as one of the institutions most plagued by corruption, particularly in relation to the lower courts. Hence, companies exhibit low trust in the judicial system and, according to Transparency International Pakistan 2007, it is not uncommon for judges as well as lawyers to solicit bribes. Contract enforcement can be problematic given the domestic court system's inefficiency and lack of transparency. Companies should be aware that the judicial system operates at a very slow pace. The judiciary, particularly at the lower levels, is reportedly rife with corruption, and most citizens have great difficulty securing effective and fair case resolution through the courts. Citizens report that court procedures are very slow and complicated and that the court system fuels the use of bribes and other kinds of influence-peddling. People give bribes to obtain a favourable judgment, but bribes are also used to influence public prosecutors. Bribes are reportedly paid to move a case more rapidly through the system. Generally, the majority of users pay bribes directly to lawyers and court officials, but middlemen, public prosecutors, and judges are also listed as common recipients of bribes. According to India's Chief of Justice Mr. Balakrishnan, the public distrust in the judicial system has caused a decrease in the number of civil disputes brought before the courts in favour of more informal types of dispute resolution. There are indications that when interacting with the judiciary, companies are faced with the same problems of cumbersome bureaucracy and corruption as ordinary citizens. The court system is severely backlogged and understaffed and, according to Freedom House 2008, there are currently more than 30 million civil and criminal cases pending - many of these being disputes involving companies. Although computerisation has enhanced the efficiency of the courts, enforcing contracts is still so time-consuming that the World Bank & IFC Doing Business 2009 reports that India is close to the worst economy in the world in terms of enforcing commercial contracts. In spite of such initiatives as the International Centre for Alternative Dispute Resolution (ICADR), companies continue to deal with a cumbersome bureaucracy. According to Transparency International 2007, these complicated legal procedures fuel the use of bribes in the justice system as a whole. The higher judiciary in India is usually considered to be more clean and transparent than the lower levels of the judiciary. According to Transparency International 2008 the Supreme Court is taking both political and general corruption seriously and bringing the issues into its judgements. However, there are but few recent examples of corruption and political protection of High Court and Supreme Court judges involved in problematic cases of judicial favours. In recent years, judges have initiated several contempt-of-court cases against activists and journalists, raising questions about their misuse of the laws to intimidate those who expose the behaviour of corrupt judges or question verdicts. Some observers report that the appointment of judges is not entirely free from political interference, although other observers estimate that India performs well in relation to independence of judicial institutions. As for public prosecutors, there are reports of vacancies being filled by a sort of 'auction process' where the person paying the highest bribe is hired. According to Transparency International 2007, evidence from specific cases indicates that the judicial system occasionally protects persons close to the party in power. Furthermore, it has been observed that corruption in justice institutions is systemic due to the high level of discretion in the processing of paperwork during trials. This means that court clerks, prosecutors and police investigators frequently misuse their power without fear of repercussions. LA Times has a story by Alex Rodriguez on the thuggish behavior of Pakistani lawyers in Lahore titled "No joke, these Pakistani lawyers are thugs"
The nation's lawyers were seen as champions of democracy during anti-Musharraf protests, but videotaped assaults by some against police and journalists threaten to knock them off that pedestal. Reporting from Lahore, Pakistan - Television reporter Shaheen Attique and his cameraman, Nasir Masood, were finishing a live shoot on the steps of a Lahore courthouse when the gang strode menacingly toward them. Before Attique and Masood could dart away, the thugs pounced. Fists rained down from every direction. Outnumbered 25 to two, the journalists could do nothing more than tense up and take it. "We'll teach you a lesson!" Masood heard one of the attackers say just before someone thwacked him in the head with a club. What distinguished the onslaught from the everyday assault and battery in this chaotic city of 10 million was what the thugs were wearing: black suits, white button-down shirts and black ties. They were lawyers, meting out the kind of street justice you'd expect to see in a barrio back alley. And Attique and Masood's crime? A day earlier, their channel, City-42, aired footage of a band of lawyers pummeling a Lahore police official outside the same courthouse. In a country in desperate need of heroes, Pakistan's lawyers have been revered as the vanguard of the grass-roots movement that helped end the military rule of Gen. Pervez Musharraf and reinstate Supreme Court Chief Justice Iftikhar Mohammed Chaudhry after his illegal removal by Musharraf in 2007.